General Contractors, Inc. hired marketing communication experts Avantgarde to handle their marketing needs. When it came time to work on the GCI website, Avantgarde turned to Getting Sites Built. While many websites these days include Flash elements, few have been built entirely around Flash technology. 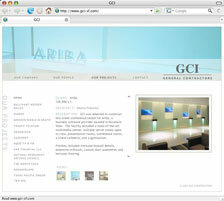 Working from early conceptual mock-ups, Getting Sites Built created a 100% Flash-based website for GCI. The result is a stunning Flash experience. The interactive elements, like scrolling text, and thumbnail picture selection, make for an elegant website that stands apart from the crowd.